We're only into our second week and we're already exhausted. It's ironic that we're more fit now than we've ever been in our lives and yet we haven't managed two dives in a day, let alone three like we did several years ago when we were both fat fat fat. We're wondering if age has something to do with it as well. Our curve ball isn't. Great news on the homefront. Old friends like Raphael were resighted this week. We've known "Raph" since 1992. Pu'u, who is Osha Gray Davidson's favourite turtle, showed up at the north foraging site. The good news for Pu'u is that the FP tumours in his eyes are now downgraded. So we've officially added Pu'u to our growing list of regression cases. While we first sighted Amuala in a July 10th snorkel at the forage site, this handsome honu has been reliably at Reef 2 most days so far this summer. It's a joy to see him go up for air and then swim alongside him on his way down to his favourite resting spot. We've known Amuala since 1995--going on eleven summers now. Some of our males have returned from East Island. 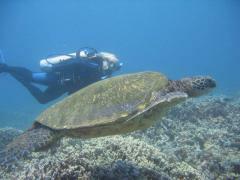 On July 16th, we sighted two ultra-clean shells that signalled honu who've been out in the "desert" of open ocean. It was Pi'i and Blue. 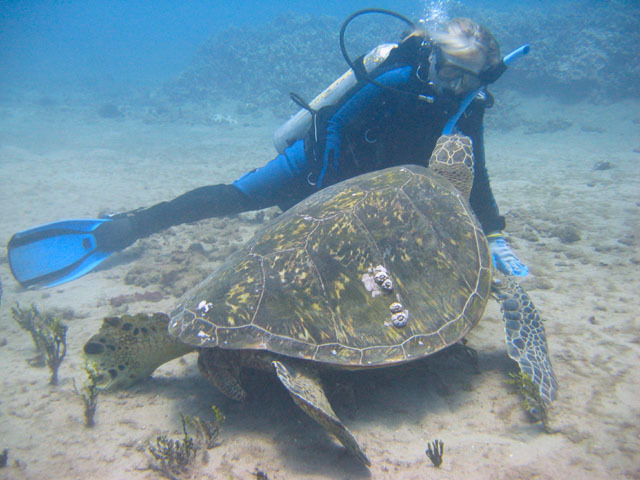 Now we don't know if these turtles made the return voyage together, but we do know we sighted both of them for the first time on the same dive. Pi'i was so tired he barely opened his eyes at our approach and just hung his head and snoozed. Blue, on the other hand, was more alert. Blue's flippers sported the many nicks and welts of a successful male suitor, so his time away was clearly "rewarding." Our July 16th dive was extraordinary in another way. 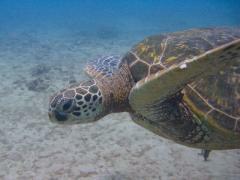 On the way back to shore, close in, we saw a surprisingly large hawksbill. Peter managed to get both a left and right profile on the turtle. 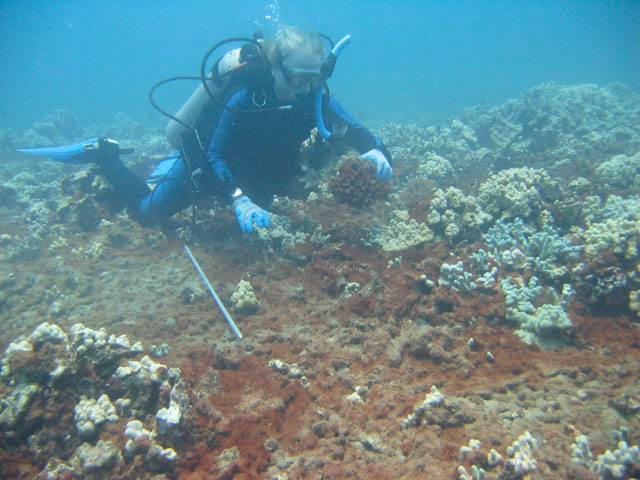 Once dry, checking our database, we can confirm that Ake is still calling West Maui home. We first sighted Ake back in 1999. 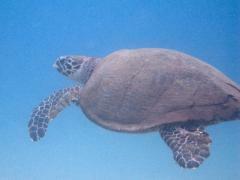 So the first hawksbill has answered roll call. One thing stands out this summer: the emptiness. For the most part, the reefs have little in the way of fish. More striking is that areas that used to host plenty of turtles are now deserted. Not only are they deserted, these rest-sites are carpeted with a brown filamentous algae. The Turtle House isn't. Corals now are mostly crushed to rubble and algae-slimed. So is the original rest-site. The Depression, which used to reliably harbour at least one turtle every dive, now is coated with algae, proving no honu has used it in a long time. Even where the reefs still host turtles, the corals themselves don't look healthy. Many are browned and show hints of green--as if algae is establishing its first colony. 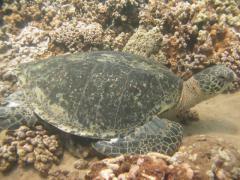 Odd as that all is, the algae that honu really need, especially the seaweed Pterocladiella seems to be on the way out! Vast areas of our dive site are conspicuous in their lack of algae. Underwater it feels like a topsy-turvy world, where the algae turtles want aren't, and the wrong algae is growing in the wrong places. 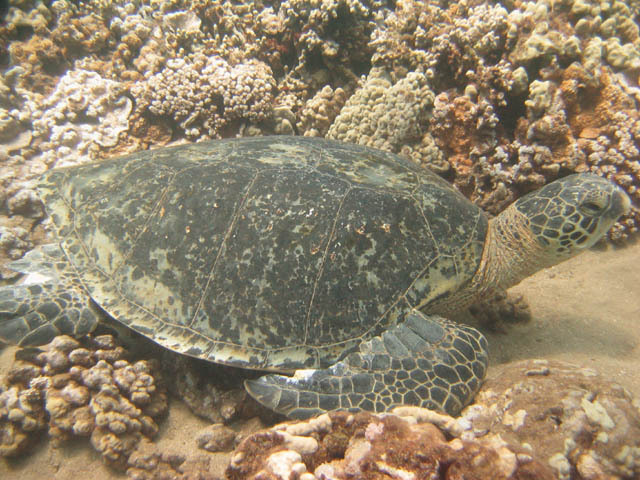 Even the old stand-by Hale Manu II, which used to host up to a half-dozen turtles in recent summers, hasn't had a single turtle resting there so far in 2005. All there is is algae. Is this what happens to turtle congregation areas? Do turtles pummel coral until the rubble forces fish to find shelter elsewhere? (We know for sure that they pummel the coral.) Does that lack of all important herbivorous fish trigger the growth of rust-brown algae-algae-algae? It's just not "Kansas" around here anymore. All that seems to translate into fewer turtles. Above all, into fewer fish. Even fewer than previous years when we thought there were "fewer fish." Dive here and you can almost believe the world is running out of seafood and that the oceans are in peril. There's also a perpetual "milk" in the water that is a throwback to the dismal haze of 1994. The entire feel is an ocean out of balance. Yet the honu who are here are chubby and certainly prospering. We have excellent news on the fibropapilloma front, as we chalk up new regression cases this summer as well. So there is good news. We were just minding out own business. You know how that is. 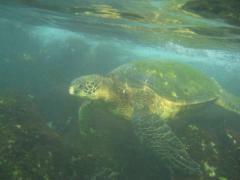 We'd stopped to adjust our camera, when we saw a honu swimming up to us. 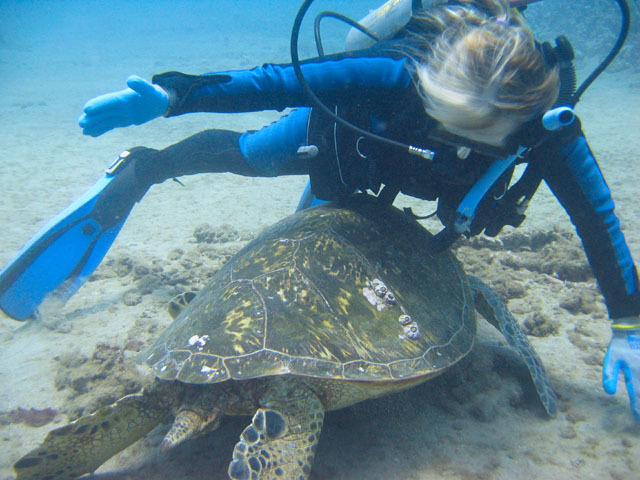 For whatever reason (or maybe the honu had no reason at all--simply felt like it) this turtle decided the place she wanted to rest was under Ursula! She wanted to rest under Ursula! ...and she was content to stay there.